​ When visitors at a couple of Farmer’s Markets in the Northeast Region look to buy fresh fruits or vegetables this summer, they might just find something else that will benefit them a few tables away. It’s environmental information courtesy of the DEP Northeast Regional Office. 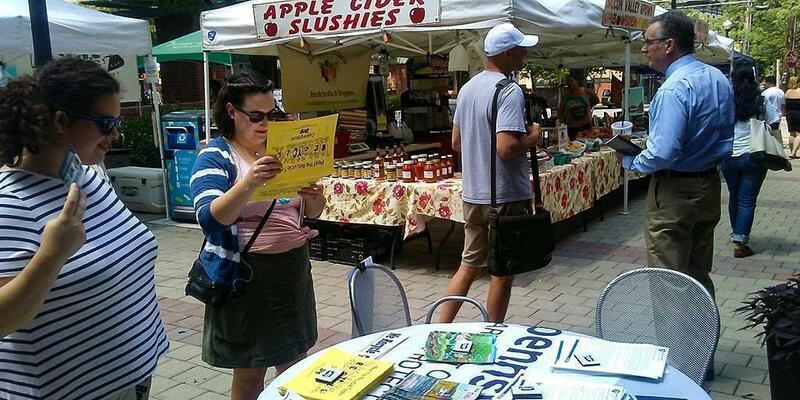 Staff in DEP’s Northeast Regional Office have been busy this summer manning the DEP booth at Farmer’s Markets in Wilkes-Barre, the Lehigh Valley and Stroudsburg. It’s part of the DEP Connects initiative. Positioned right next to tables of apples, plums, fresh broccoli and apple cider slushies are DEP displays, demonstrations and literature on environmental issues that affect people’s everyday lives. At a recent event in Wilkes-Barre, Waterways and Wetlands staff featured a scale model of a small community, complete with roadways, farmland and business, to show how contaminants spill off property by way of stormwater runoff, and can pollute waterways. Safe Drinking Water staff provided literature on how to get water tested for lead, and how to properly chlorinate a private well. DEP’s Bureau of Abandoned Mine Reclamation staff show residents in Luzerne and Lackawanna County where abandoned mines run near their properties and how important Mine Subsidence Insurance can be. It’s amazing what you can learn by looking at a scale-model community and runoff demonstration. One quick spray of water mixed with coffee grinds provided a quick demonstration on how dirt/rocks can enter storm-water. The DEP Stream Guide came in handy to answer the many questions on preventing pollution in streams. DEP is sharing information at its booth on: West Nile virus prevention, biosolids, disposal of hazardous household waste, and recycling tips. Look for DEP’s Northeast Regional staff at other upcoming Farmer’s Markets. Air Quality staff plan on demonstrating a hand-held air monitoring device and how it can detect levels of contaminants in the airway and protect residents. Waste Management staff will display a scale-model landfill to show how garbage is layered, capped and how leachate is collected, along with methane. Environmental Clean-Up staff plan on demonstrating on a small-scale how DEP uses absorbent pads to clean up a spill in a waterway. A little bucket filled with water and mixed with oil demonstrate how it’s done. DEP will also participate in a recycling-themed Farmer’s Market in Stroudsburg to educate the public on single-stream recycling, composting, and how electronic recycling works. Look for DEP staff at other area Farmer’s Markets this summer. DEP Connects … by way of fruits and vegetables!